Mom's Gone Bronson! 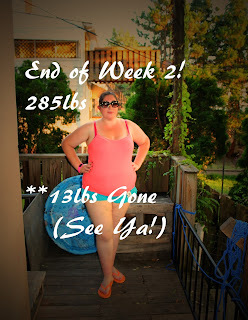 : Nutrisystem - Week 2 Results! Disclaimer: I was provided with Nutrisystem food in exchange for my honest opinions based on my own story and progress. Your views and experiences may differ. Thank you! Well here we are - the end of week 2 and the beginning of week 3. I can't believe how quickly these last 2 weeks have flown by. I started out this week eating snacks instead of taking shakes and am no longer on the Turbo Take Off. My weight loss has slowed a little and that is exactly as expected, which is also a healthier speed at which to lose the weight. I lost 3 more lbs this week, taking me down to 285.4lbs and that brings a total loss to ALMOST 13lbs! (12.6lbs to be exact), which is just so amazing that I can't describe it. I have not been hungry at all this week, I have allowed myself to mix and match the foods and have tried a couple of flex meals, where I make the meals myself instead. I had lamb and vegetables for the one meal because I had been given a nice bit of lamb and I haven't had lamb in about 7 years, so I couldn't resist. I did stick to a very small portion, though and included everything I needed to make it a proper meal. I have been following everything else pretty meticulously other than that and have included yogurt into breakfast or milk to a snack via a latte and so on, to get the things I need throughout the course of the day. I am making it work and I feel like I am constantly eating, too. I am really making the effort to keep on a time schedule with the food and putting in exercise and getting my daily dose of water as well. All in all, I have had a great time trying out the foods and keep coming back to certain favorites like the waffles and pancakes, which I make with scrambled egg in the morning and which I have come to learn to love in smaller portions, which are actually now very satisfying. I did come across one meal that I didn't like quite as much as the others, this week, which was the meatloaf and potato, but I think that might be because it was a little bland for my tastes. Once I added some non-salt seasoning of various spices, it tasted great, though, so it was totally redeemed and I couldn't really stay away! I have been preparing foods the night before I need them and made sure to stick to the items i've picked out and not stand at my fridge trying to decide for hours the day of! The fact I just have to get up and go get what I want, without really thinking about it, is really helping - especially because I usually take forever to decide on anything at all, let alone food. I am looking forward to getting into WEEK 3, so let the eating begin! Check out all the delicious ways to enjoy Nutrisystem via #NSNation #NutrisystemSnaps and @Nutrisystem on Twitter, too! See you there!